A lot can easily change between now and the year 2012 in Major League Soccer. But after yesterday’s comments in Montreal made by MLS commissioner Don Garber, the league may be expanding more now than we really had ever thought it would. When addressing the expansion probability for Montreal on a day that they opened their new stadium (Stade Saputo), Garber said his usual 18-club league by the next few years but did add that they feel like they could do more than that. He didn’t explain how many more cities or how long of a time frame for that. The main point he made was that the league is going to take their time and get it right. Team values are going up as well as the expansion fees for these cities. The cities in the mix are just hoping to cash in on the fun before its too late here. Now this isn’t a talk about the league expanding too quickly or things that need to be in place for the league to expand to 18 or even 20 clubs. We know those things and will be able to point them out at another time. I’m sure MLS is looking at the long-term picture of the league here and is hoping to finish shaping the league’s expansion over the next five to 10 years. I just wanted to take time today and throw out what each city has to offer and what still needs to be done with each. The latest rounds of expansion have easily been the best the league has seen in it’s short history. Getting clubs in towns like Toronto, Seattle and Philly were key for the league. Its paid off too as Toronto continues to sellout their stadium, Seattle has reportedly gotten between 15,000-16,000 season ticket holders for next year, and Philly is nearing in on the 6,000 season ticket total for when they start in 2010. Its obviously a good thing for cities like Montreal, Portland and Vancouver to be in the spot light in recent weeks for various reasons. Each are hoping to be one of those next two expansion cities but just as the other hopefuls they all have work to do. Garber said they would know where they want to go within the next year. So don’t be too shocked to see cities pop up in the discussion over the next couple of months, especially before the All-Star game. Each will want to put their best foot forward in hopes to get that next bid for the 17th and 18th spots in MLS. So let’s break it down about what each has to offer MLS (no particular order here either). I may miss a point or two so feel free to comment on them below. St. Louis: We all know the Gateway city has a long history with soccer in America. Loads of MLSers have been brought up in this soccer-crazed town over the years. Stadium deal in place with the local and state governments. Provides a distinct rival for Kansas City and Chicago, and maybe even Columbus. Passionate owner in Jeff Cooper. Not as strong in the bank as MLS would like Cooper and his group to be. The league has stated they need a stronger financial group in order to be competitive in MLS. May have problems coming up with the money for the expansion fee of $40 million. Questions on whether or not the location of the stadium is good or not. Collinsville is 12 miles east of downtown St. Louis. Will they really be called St. Louis United or St. Louis Soccer United if they join the league? Will anyone step up and sign on with Cooper on this bid? Or will this end up being a prime location for a relocated MLS club in the future? Houston was that choice a couple years ago, and now some are wondering if St. Louis is that next in line for relocation rather than expansion. Montreal: With the recent opening of the Stade Saputo for USL-1’s Montreal Impact. The city of Montreal easily moved near the top of the expansion list for MLS. Its too small of a stadium right now for MLS but if expanded it would easily be another quality venue for MLS games. Another solid Canadian fan base. Stadium is brand new and already in place. Lead USL-1 in attendance each of the last 3 seasons, most feel that would translate well for a MLS club like in Seattle. Provides a Canadian derby with Toronto. Stadium is nice but needs expansion to join MLS. Right now its only a 13,500 seat stadium; it would need to be at least 20,000 for MLS according to Don Garber. Questions on whether or not the league needs more than one Canadian team has come up with some over the last several months (weird argument if you ask me). We won’t know if a USL franchise has success in MLS until after next year with Seattle. Will they be called the Impact if they move up to MLS? What kind of rivalry will it be with Toronto? Besides overall seat expansion of the stadium, what else needs to improve? Portland: Another city that would love to move up into the big leagues of MLS. They have a stadium that needs work, an owner who wants the promotion and a very solid fan base that is MLS ready. Another town with a solid fan base. Timbers Army is probably one of the more knowledgeable supporters groups out there. Provides a great rival to Seattle Sounders FC. These two clubs have a nice history against one another and MLS would love to get their hands on it. It would easily be one of the better rivalries in MLS. An owner who is ready to spend the money on a MLS club. A stadium already in place that has seen its fair share of soccer over the years with Women’s World Cup games and other friendlies. Not to mention its at a solid location in Portland. Another passionate soccer town on both a professional and college level. No other sports besides basketball to compete with in the local area. PGE Park needs lots of improvements. They will have to get rid of their stadium-mates (Triple-A Portland Beavers), who will be possibly getting a new stadium. Questions on whether or not the club owner and his group have the money to spend on an expansion bid, stadium improvements and a new baseball stadium. Is Portland really ready for a MLS club or are they still a few years away? Are they really a lock for a bid if those stadium improvements happen? Would they keep the Timbers name? I think they’d have to really but you never know with expansion clubs. Vancouver: Another Canadian city looking to cash in and join MLS in the next few years. Stadium construction issues surround their bid but with a new temporary home at BC Place, MLS could look their way if everything adds up correctly for them. IF the waterfront stadium goes through and is built, MLS would love to expand here. Shown in past exhibitions and friendlies that they can draw good crowds. A temporary home like BC Place may be a solid home until a stadium is built. Decent fan base, two large supporter’s groups. Provides another rival to Seattle and Toronto. Though the Seattle rival is more deep based on USL history. The stadium issues are huge with this bid. Not having the waterfront stadium in place is a killer item MLS has to look at. Questions surrounding money with the owner as well for the expansion bid. If Montreal is given an expansion bid before Vancouver, the argument about three Canadian clubs in MLS. Is Vancouver really a market MLS needs to be in? Past professional team in Vancouver for US leagues haven’t worked out too well. Does the ownership group have the money in place to not only draw well but do well in MLS compared to the USL? Same as the other USL clubs in regards to club name, would they be called the Whitecaps? Miami: The league has said before they want to return to the South with a club sometime in the future. Miami once had a MLS club for a couple of season but it folded along with Tampa Bay. But with a new possible stadium deal in place with the city, MLS has to take a close look at Miami once again. The possible stadium at the old Orange Bowl site in downtown Miami may be too good to pass up for MLS. The failures of the Miami Fusion were due to the club being outside of Miami, a downtown team is expected to draw much better. A couple different ownership groups are lined up for this bid if it comes through. Could easily cash in on the demographics of the region if the team plays in a new stadium in downtown Miami. No word on who or which potential owners are in line for this expansion bid. Or just how deep-pocketed they are. The failures of the first Miami club. The potential chance the soccer stadium deal could fall through. Things were kinda iffy when they laid it all out to me. I’m sure I’m not the only one who was questioning it. Fan base. 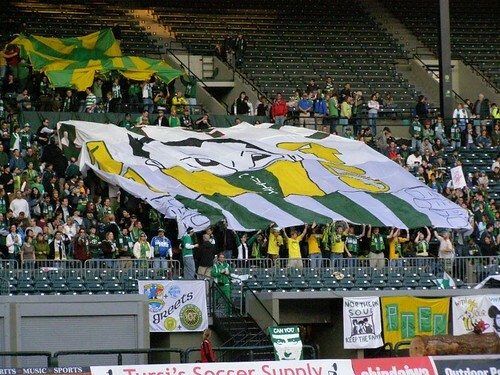 I know of the Ultras but they aren’t nearly as big as the Sons of Ben or even the Timbers Army. No clear rival in the league to gain interest of the fans. Would they seriously be rivals with a Columbus or DC? I doubt it. Will Miami actually work a second time around? This isn’t like San Jose, where the city was given a second chance by some passionate fans and owner. Where will the fans come from this time around to support a club? Can the league afford not to be in the South for another 10 or 20 years? New York: A lot of people either want a New York club (not a New Jersey club like the Red Bulls) or think its a total waste of an expansion bid. If a potential owner steps up like there had been reports of doing, this could easily be a smart place to have a MLS club. Being in NY and not in NJ for starters. A stadium in Queens would easily get some passionate soccer fans that Giants Stadium doesn’t get. A club in the heart of the city would be huge. A nice rival for the Red Bulls and for the New England Revolution. No word on if Welpon and his group are that serious. No actual stadium deal in place at the moment. Too far down the line in the expansion order for some pundits out there. Plenty of other potential issues that we aren’t aware of at the moment. How serious/important is the league at getting a second club in the NY market? What would a second NY market team mean for the Red Bulls? I left off some other expansion hopefuls that we will probably see get hyped up over the next couple of months here. I really feel these six are the main six that the league is looking at for the next two to four spots for expansion. Towns like Las Vegas, San Diego, Atlanta, and Phoenix are still in the mix but are on the outside looking these days. Sorry, St. Louis and Miami, I just don't see the point in giving you teams. Maybe if the MLS decides to go past 20 teams, but that's unlikely I think. Sorry, St. Louis and Miami, I just don’t see the point in giving you teams. Maybe if the MLS decides to go past 20 teams, but that’s unlikely I think. The Ultras are not as big as Sons of Ben yet, but we are working on it. We have plenty of soccer fans so we know we will be big soon. – The team would still be called the Whitecaps. The name has a long history in Vancouver. They are not going to change it. – The Vancouver Whitecaps in the NASL did very well, had good attendance, and a large season ticket base. They also won the title to boot. Despite the small stadium that they currently play, and its limitations, the team draws well. – The owner of the Whitecaps has the needed resources and some. – Vancouver – OR – Portland should be in the first 20 teams, but I don’t think all three Cascadia Cup teams could function at this point in the MLS. I love all the cities mentioned here, and I think they have great things to offer, but those who say &quot;ABSOLUTELY NO&quot; to Miami, haven't been here in the past 5 or 6 years, and if they have they've only been to South Beach. I think MLS can't afford not to be in Miami. I'll will support all the cities that get a franchise, and will continue to follow MLS, but no team in Miami would be a huge mistake. I love all the cities mentioned here, and I think they have great things to offer, but those who say “ABSOLUTELY NO” to Miami, haven’t been here in the past 5 or 6 years, and if they have they’ve only been to South Beach. I think MLS can’t afford not to be in Miami. I’ll will support all the cities that get a franchise, and will continue to follow MLS, but no team in Miami would be a huge mistake. There is only 5 possible cities in the west, the first 2 make more sense to the MLS (By the way MLS is a boring name for the League, the MLS should change its name in the following years if the league has 20 teams). Number 3, 4, 5, dont really have the power, the charisma for a soccer franchise. But in reality, MONEY TALKS and SOCCER SPECIFIC STADIUMS talk as well. But at the end, Vancouver and Portland will join the league. As you can see, the EAST region has more cities to work with. From my point of view, the EAST is a puzzle that can be put together with MONEY and SOCCER SPECIFIC STADIUMS. I believe Montreal has to be in for sure, if they are not, Don Garber shoot yourself in the head. The next city from the 7 left, that should be given a MLS franchise, it actually can be a surprise city, like Cleveland or like we have heard before NYC or St.Louis. The EAST region is a puzzle, but i would not be surprise if MIAMI would join the League or even a city from NORTH CAROLINA. In conclusion, the WEST can end up with 11 teams, including the new comers Vancouver, Portland, and I say Las Vegas. Then the EAST is harder to figure out, with also 11 teams including Montreal, St.Louis and Miami. With each region having 11 teams, the total of teams comes out to 22, so the thats when PROMOTION comes into the league working with USL-1. The league can also break up in three regions, WEST, CENTRAL, and EAST, each region having 7 teams and ppromotion can still be involved. 4. Chivas U.S.A. 4. D.C.
And then there is tv contracts which will come if a city shows support for a team over long periods. I hope the league doesn’t get to crazy with expansion as it does in Hockey and BBall. North America needs to build up to it. Soccer specific fields in good locations is one key to ensuring a good fan base. Toronto did it perfectly with a stadium downtown, and easy to get to. This ensured true soccer fans could attend and not just the soccer mom situation we often find with suburban large stadiums far out in the burbs. The soccer specific stadium ensures an exiting atmosphere. While Seattle may have a convertable field from football, the cavernour 70000 that it holds will kill the atmosphere, unless Seattle expects Man U like attendance. North American should go the way of some how creating feeder leagues with promotion a way of connection similar to the European leagues. Monetary rewards for moving up. Beginning June 7th, join us all month long for each and every soccer game featured in the Euro Cup 2008. Root on your favorite team while drinking our International Beers at a special price. Each game will be featured on our 21 HDTV�s with sound throughout the Pourhouse, so show your Patriotism and come decked out in your country�s colors. I beleive that the Sounders are going to Close the upper part of the stadium. Also keep in mind they have already sold 16,000 Season Tickets. I would say that is pretty impressive.